Stainless Precision Engineering or SPE (Pty) Ltd manufactures hundreds of different components and sheet metal products in steel, stainless steel and aluminium. African Fusion visits the facility and speaks to Hannes Marlin and John Kingsbury about the use of welding robots in a jobbing shop and effective automation for batch production. Left: Hannes Marlin, director of SPE (Pty) Ltd. Right: John Kingsbury, a boilermaker and draughtsman, now responsible for welding and the robot welding programs at SPE. Welding robots have long been the preferred solution for continuous production lines such as those in the automotive industry, where the volumes and the repetitive nature of the tasks justify the development of the jigging and programming in order to achieve consistent weld quality. Recent developments however, like off-line programming and flexible jigging, have considerably widened the cost-effective envelope. SPE embraces new technology whole-heartedly. A first impression is that of the factory filled with the black and red Amada CNC machines – punching machines, laser cutters, hybrid laser cutting and punching machines and, in a class of its own, a totally unmanned robotic bending system – an AMADA Astro 100 NT cell that consists of a bending robot, a loading/unloading robot, an HDS103ONTR press brake, and an automatic tools layout changer – capable of producing bends at approximately 10 seconds per part. Marlin takes us over to one of the latest innovations at SPE, a purpose-built pair of interacting robot welding cells to greatly improve welding capacity at the facility. “These are long-reach (3,1 metre) robots that can each work on two different stations. We also have three manipulator systems that can turn along various axes – seamlessly integrated with the robots,’ he says. Fanuc robots are being used with Lincoln Electric Power Waves (F355is) and integrated with Binzel torches that have wrist-mounted push/pull wire feeders. Marlin introduces us to John Kingsbury, a boilermaker and draughtsman now responsible for all the welding programmes on the robots. Kingsbury takes us behind the screens of one of the robots. An operator is jigging up a tubular chair-leg frame. He slides it onto a jigging table between two end stops. He then slides six mounting plates into position, and the robot is ready to weld. We watch the robot performing six welds and as soon as it stops, the operator slips the welded frame out of the jig and the next on is slid in. “The robots are used for larger volumes, either long runs or batches. We are a jobbing shop, so the robot set-up has to be flexible so that we can quickly change over from one product to another,” explains Kingsbury. 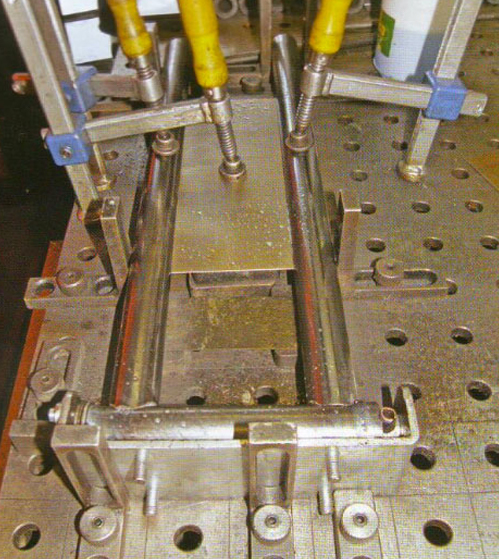 The adjacent cell is welding hinges onto swing gate frames – for use in supermarkets, Kingsley explains – a similar application to the chairs with different jigging. “These German jigging tables are produced by Demmeler. It’s like a little Lego set, that help us to get perfect fit-ups,” continues Marlin. “Because we have to be very flexible, we need to be able to change over our robot set-ups very quickly. This system makes the task very simple – the table and all the bolts, blocks and clamps are all nicely integrated to make jigging a really simple task,” Marlin tells African Fusion. He tells us about the Binzel torches: “We first had a different set of torches, but these weren’t suitable for welding aluminium – a bit of an art to do on a robot, which not many people can offer. We decided that we could extend our service offering if we had an aluminium welding capability – we were already cutting and bending it, we just couldn’t weld it. So when we chose the welding robots, we included the Binzel welding torches so that could do aluminium as well.” The push/pull torch is water-cooled and designed for the full range of automatic MIG/MAG applications in terms of wire size, material and operating current level. The torch has been integrated into the Lincoln PowerWave MIG/MAG system to ensure that the Binzel pull-feed motor on the wrist of the robot always runs a little faster than the pushing wire-feeder, so as to always maintain wire-tension in the liner and prevent snarling. Also integrated into all welding operations on the shop floor is the gas supply, which is stored in Air Products Maxitanks at the back of the factory and piped to all of the robot cells and welding stations. Marlin and Kingsley take us up into the drawing office to show us how they achieve a quick changeover between different batches. “On the robot side, we use a package from Fanuc to teach the robot off-line,” Kingsley explains. “I bring in a 3D SolidWorks image of the component and we place it onto a jig that will perfectly match the real one on the shop floor. Then I work out a welding sequence and procedure and programme the robot – torch angles and trave; speeds – to move through the sequence. We set the welding parameters and then we do a test run. “We usually need to do some fine tweaking but once that is done, then it is ready to be sent to the robot,” he adds. As well as the robots, SPE’s welding department consists of eight more welding bays equipped with MIG/TIG combination machines for manual welding in mild and stainless steel. Three spot welding machines and stud welding equipment make possible all variations of permanent joining procedures. “Our goal is to have everything automated, to minimize the amount of work we have to do by hand. New technology pays for itself very quickly and the new machines offer lower costs, better quality and more capability to the customer – and that is what it is all about,” he concludes. 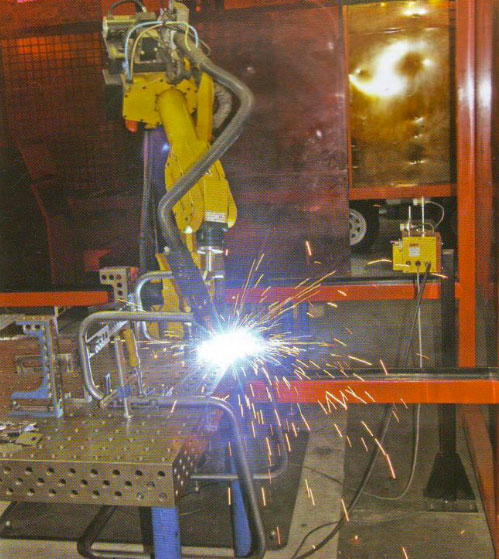 Left: A welding robot system – developed by Robotic Innovations, with a Lincoln Electric F355i power source integrated with a Binzel water-cooled push/pull torch – being used to weld mounting brackets onto a chair leg frame. Right: The Demmeler integrated table and jigging system that enables set-ups between welding jobs to be done simply and quickly. Robotic Innovations 2018. All rights reserved.